If you have some real talent with hardware project building, you might be interested in this article about building your own portable mp3 player. Just be aware that it is not for the meek. Project description – This is not a beginner project! 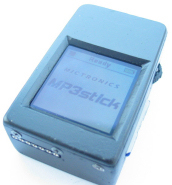 The MP3stick is a simple and small portable MP3 player. A microcontroller Atmel AVR ATmega128 is the heart of the circuit. MP3 decoding is done by an VLSI VS1011b decoder IC. A MMC/SD card works as memory medium for MP3 files, playlist files and skin files. The player is designed to draw his power from a LiIo/LiPo battery with 3.6V. a charger cicuit, based on MAX1811, is included. All information will be shown on a Nokia color LCD with 128×128 pixel and 256 colors. The player will work in text-only mode and if a skin file is available, also with nice graphic skins. A docking port allows outside connectivity for serial control signals, audio signals and charger voltage input. All the necessary hardware is detailed in the guide following the introduction. A number of pictures are included to see various phases in the build. Firmware information is given. Even finaly build size (22x39x64mm) and approximate battery life guidelines are included. The work on this is impressive, and if you have the talent to build, this looks like a great project to get involved with.